For pre war sets click here. Con. - later name for the Accessory Outfits eg Set 4X rather than 4A. *Note: The lids and instructions of the Light Red Green outfits changed in 1962 see here for details. For more information visit Melvyn Wright's excellent website on this period. **Note: In this period with the radical colour change from green, the parts were initially sprayed with silver paint. This was gradually changed to using zinc plated parts. You could get sets that were a mixture of silver sprayed and zinc plated parts. See example of #1 perforated strips. Sets were also named as you can see in this image. In this period Meccano Limited also produced several special purpose sets, which arguably, were the best products that ever came out of Binns Road. This page arose out of a discussion on spanner about stringing sets. The string used for stringing was slightly thinner, before the war, than part 40 supplied in the sets. After the war the string was thicker than part 40. Also special washers, originally used in Hornby Train wagons, were used in the knotting process. 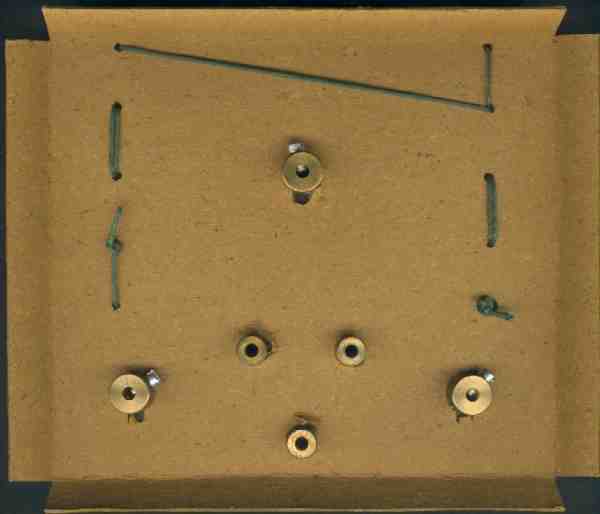 Below is an image of the reverse side of a black/yellow/zinc 9 set. The stringing card containing sprocket wheels. The zinc bolts (as opposed to brass) in the wheel bosses can be seen. For more information on stringing click here.